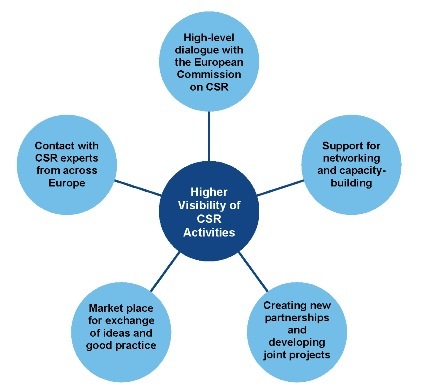 The CSR Alliance was launched in March 2006 by the European Commission, with members of the business community and support from business organisations such as BusinessEurope, SMEunited (formerly called UEAPME) and CSR Europe. This coincided with the publication on 22 March 2006 of the European Commission communication entitled "Implementing the partnership for growth and jobs: making Europe a pole of excellence on corporate social responsibility (CSR)". The Alliance aims to contribute to the promotion of CSR throughout Europe. It acts to demonstrate the value of voluntary business engagement and the difference it can make. It casts a light on innovative CSR practices, stimulates new ones and further eases private initiatives in this area. It is an informal grouping and does not involve specific rules or requirements, a charter, signatures or heavy processes. The European Commission does not directly manage the Alliance. It relies on the business community itself as well as on the support of business organisations. More than 150 companies have so far expressed their support for the Alliance. The Alliance remains open. Any business, whatever its size, can become involved. What opportunities does the Alliance create? What are the benefits for your company? How to join the Alliance? How to get involved? Business organisations such as BusinessEurope and its members offer to coordinate matters in relation to the Alliance, keep track of developments and activities and help communicate them. They also offer to act as an interface between Alliance companies and the EU institutions and foster contacts between companies supporting the Alliance. Organised at regular intervals with the European Commission, meetings communicate results and take stock of the Alliance's achievements. At the high-level meeting on 4 March 2008, Emmanuel Julien, former Chair of BusinessEurope’s CSR Working Group highlighted that for business, achieving economic, social and environmental sustainability is more important than ever and therefore determining business strategies. The "Progress Review 2007" was presented on this occasion. No higl-level meeting was organised in 2009.